How to Recover Deleted SMS Messages from Nexus 6? Home > Resources > Others > How to Recover Deleted SMS Messages from Nexus 6? You finally got your long-anticipated Google Nexus 6 recently and just find it is a great gadget for communicating, working and entertainment. But it doesn't mean the phone is perfect. You can also find that there is a trouble that there is no obvious solution to recover lost data from the Google Nexus 6, especially when you accidentally deleted important files, formatting the phones or get the phone system corrupted. For example, when you want to delete a useless text message on your Nexus 6, you just have your hand slipped and cleaned the whole SMS box. If you mistakenly got some of your valuable text messages deleted on your Nexus 6, what will you do? Those messages might be important and even related to your business. Can it be simple to restore lost SMS messages from Nexus 6? Do not bother yourself any more. A processional Android data recovery program named Coolmuster Lab.Fone for Android will help you out. This software makes the SMS recovery task simple and direct for everyone whatever the reasons they lost the Nexus 6 text messages. Only several mouse clicks will enough for you to get back the lost text messages. What you need to do is just clicking the following button to get the free downloadable Nexus 6 SMS recovery software downloaded on your computer. And only three steps as below will accomplish the SMS recovery process. Note: Before running this software to recover deleted text messages from your Google Nexus 6, you should root your phone first. Connect your Google Nexus 6 with PC. Install and launch Coolmuster Lab.Fone for Android on the same computer. Then, the software will detect the connected Nexus 6 and show it on the program window. If not, you may need to enable USB debugging on your Nexus 6 beforehand. Just follow the instructions below to do it. After the software recognized your connected Nexus 6, it will scan the device immediately. All found SMS messages will be scanned out. You can touch the "Message" option to preview all messages on your Nexus phone. Select those text messages you want back and click the final button of "Recover" to save them on a safe place on your computer. Please do not save the recovered files back to your Nexus 6 so as to prevent the data overwritten. 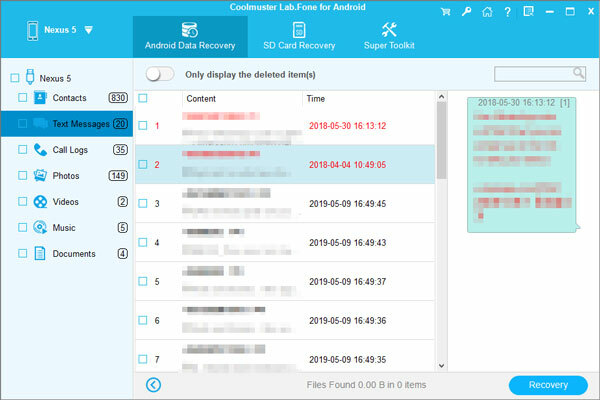 Now with the help of Coolmuster Lab.Fone for Android, you can effortlessly retrieve deleted and lost data on not only Nexus 6, but also other Android devices like Samsung, HTC, LG, Sony, Motorola, etc.